Transit users in Ottawa may be seeing some faces on the bus this week they’d ordinarily see on campaign signs. Seventeen of the city’s 23 councillors have agreed to take public transit for one week. Ottawa’s first Transit Week Challenge started on Feb. 4. The initiative was launched by the transportation advocacy group Free Transit Ottawa and backed by several other local transit organizations. The challenge is intended to highlight the good and not so good of the city’s public transit system and spark a push for more accessible and functional transportation. 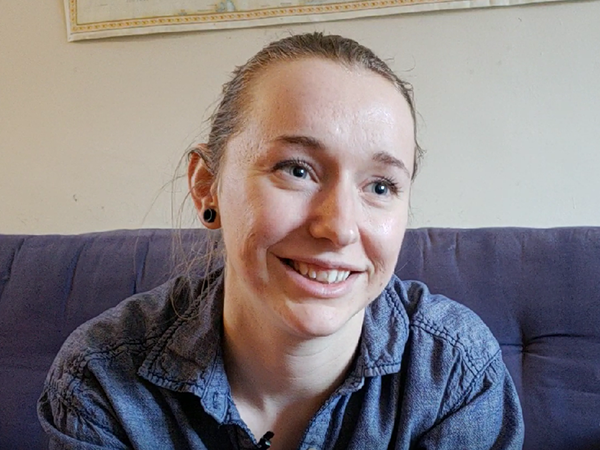 “What we’re expecting [councillors] to find is what people like me experience every day, which is delayed buses and missing buses and snow-filled sidewalks and difficult commutes and transfers and being late to meetings and late to appointments,” said Kirsten Pulles, the challenge’s lead organizer. OC Transpo’s website boasts a goal to arrive on time 90 per cent of the time, a plan the service says is “the most ambitious … performance target for transit anywhere in North America.” Buses are monitored around the clock by the city’s Transit Operations Control Centre, where staff can send out extra buses and drivers in response to delays caused by heavy traffic or weather. 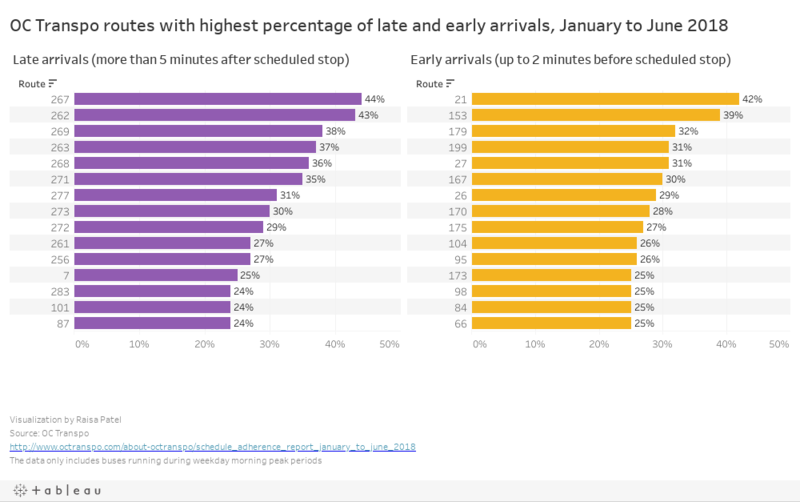 Despite the lofty goal, an analysis of schedule adherence data from the first half of 2018 shows that many routes experience relatively high levels of late and early buses. During this period, Kanata’s route 267 was the bus most often late, which is defined as arriving more than five minutes after a scheduled stop. The bus, which serves Glen Cairn, arrived late 44 per cent of the time. The data only includes buses running during weekday morning peak periods and is collected from each vehicle’s on-board GPS. Another suburban route, Stittsville’s route 262 serving West Ridge, was a close second. It was late 43 per cent of the time. Stittsville Coun. 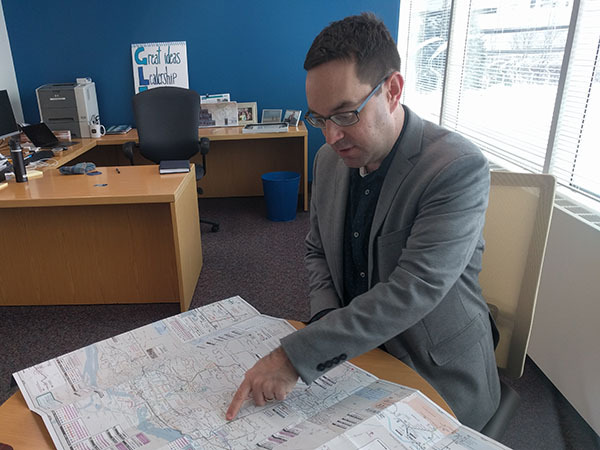 Glen Gower — one of the first councillors to sign up for the challenge — calls it one of the city’s “least resilient routes”. “I think it’s cancelled if it’s overcrowded. 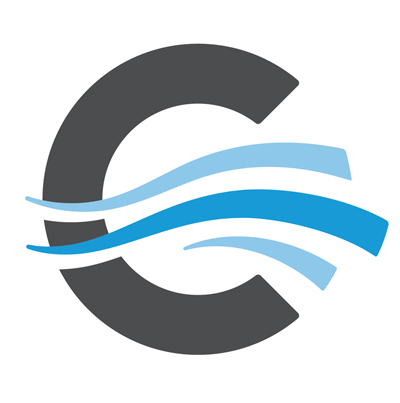 There are people waiting at the Carp Road Park and Ride right there, they’re waiting there in the cold a long time and they have no other option,” Gower said at his City Hall office last week. Ottawa’s Confederation LRT line — set to open after March 31 after numerous delays — is expected to improve reliability. 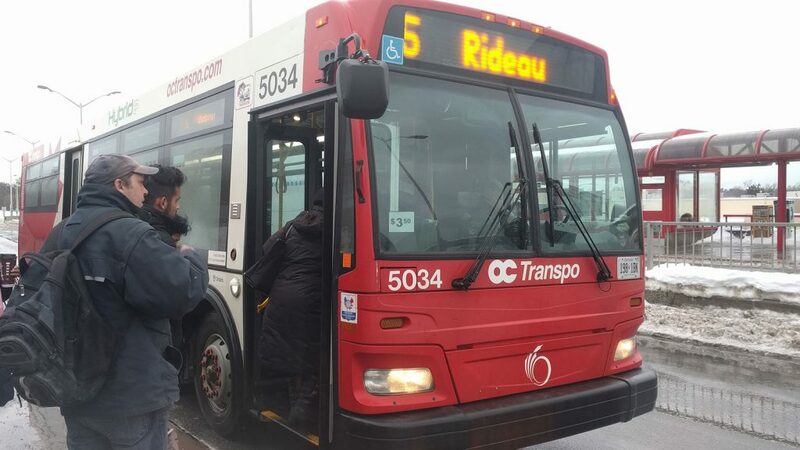 “Most of the delays that affect our bus service occur in downtown or on the congested detour corridors,” said Troy Charter, OC Transpo’s transit operations director in an emailed statement. But the LRT is not likely to help those in the farthest reaches of the city. And larger policy questions remain, such as how suburban routes will shift in the future, especially in places seeing large population growth, such as Barrhaven. “If we want our suburbs to work more sustainably with less reliance on the automobile, I think we really need to begin addressing how buses move within our suburbs,” said Kitchissippi Ward Coun. Jeff Leiper, who is also taking part in the challenge. Elsewhere in the city, there are signs of discontent. It’s followed by a long list of identified issues, such as poor communication. Kari Elliot, the group’s co-founder, said the issues need to be properly identified before solutions are proposed. One issue that has been identified by critics is that fares are too high for the level of service received. The city has said it will freeze fares temporarily, with further details forthcoming in the 2019 budget. 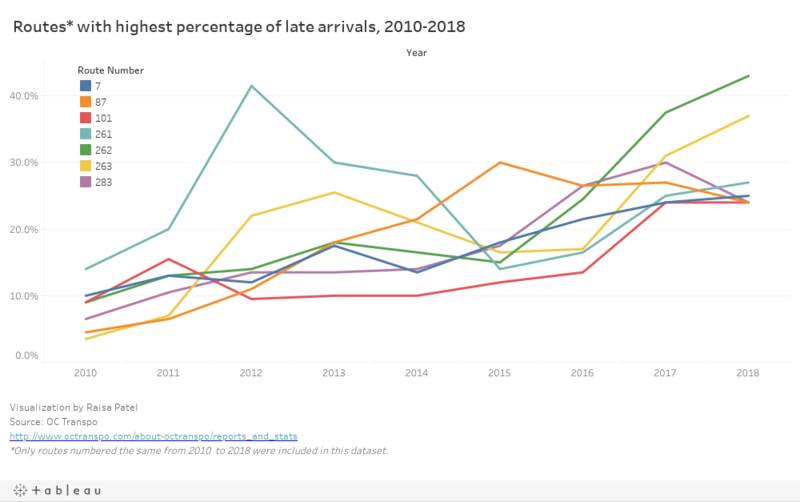 But over the long term fares are expected to steadily increase. Leiper said he hopes more funding can be found to reduce fares. “Taxpayers, even if they don’t use the bus, get all the advantages of having other people take the bus,” he said. Whatever happens, real improvement will require more money, he added. The Transit Week Challenge ends Feb. 10. Feedback will be collected from participants and presented to the public on Feb. 11.